Discover the New OsteoCleanse™ That Uses NASA’s Discovery to Help “Jumpstart” Your Body’s Ability to Keep Your Bones Healthy! I simply didn’t know what I didn’t know. And because of that, I suffered way more than I should have. From the fear, to the frustration, the worry and the guilt, the amount of pain I encountered on my journey to bone health is not something I ever want to experience again. If you are reading this right now, then the one thing I know about you is that you are interested in the health of your bones. And it’s for people just like you that I created the Osteoporosis Reversal Program™. That’s the Program that has helped so many people all over the world build stronger, healthier bones… naturally. What’s the problem with the Osteoporosis Reversal Program™? It’s not that the Program isn’t powerful. That’s not the case at all. In fact, I know of no other solution that is more effective for helping you achieve healthy bones, over the long term. The problem is that most of us are dealing with such an uphill battle, that we need something to effectively “turn back the clock” and give us a fighting chance at healthy bones. That “uphill battle” is a result of the many toxins that have accumulated in our bodies. Whether it’s breathing less than clean air, drinking chemical filled tap water or eating preservative filled foods (aka the standard Western world diet), we’ve all given our bodies a huge amount of work to do to keep us alive. This doesn’t even include the prescription drugs most people take or even the damaging effects of common osteoporosis drugs. The body is a truly amazing thing. The fact that it is designed to withstand such abuse and STILL get us around is nothing short of a miracle. But there’s a secret that most people don’t understand — the secret is how certain organs in the body play a major role in the health of your bones. I can remember when I first discovered this. It was the day I came across a presentation done by a doctor for NASA on the connection between the kidneys and the health of your bones. Boy was I excited to find that study. I kind of felt like I had hit the jackpot. Because the information I found connected some dots for me about how to make a major impact on the future health of your bones. The little known connection between your kidneys and your bones. The kidneys act like filters for your body. Basically, they remove waste from your body. The better they work, the “cleaner” your body is. As you age, however, your kidneys become less effective. They do this even though you might otherwise be in great health. It’s just the natural order of things that as you age your kidney function starts to decline. As I mention almost any chance I get, the average western diet is highly acidic. That leads to a body pH that is acidic, which starts a chain reaction that can cause a huge host of problems—bone problems in particular. Kidneys help remove some of this acidity from the body. But as you age, they become less and less able to do this. With the highly acidic western diet, they just can’t keep up. So your body eventually goes elsewhere looking for ways to restore the acid-base balance. As I was reading through this research, it struck me… because of this kidney/liver/bone health link, taking some of the load OFF of these vital organs could create major changes in bone health. And that’s when I decided to create something that could help you jump-start this process. Something that could help your body get rid of the toxins, lighten the load on your important vital organs, and move you in the direction of resolving the low grade acidosis (that means your body is tipped towards the acidic end of the pH scale) that most people spend years dealing with. The good news is that you can “fast track” your body’s ability to heal itself and grow stronger bones! Soon after I released the Osteoporosis Reversal Program™, I realized that most people needed an extra boost to clear away the years of damage their bodies have endured. The fact is, our current world is full of chemicals and toxins that compromise our body’s ability to grow healthy bones. So if you’re going to steer clear of all of the pain and suffering that comes with unhealthy bones, you have to take matters into your own hands! And that’s why I created OsteoCleanse™: The 7 Day Bone Building Accelerator. OsteoCleanse™ is a seven day process that flushes out the toxins in your body and sets the stage for restoring the health of your bones through the Osteoporosis Reversal Program™. If you want maximum benefit from your bone building efforts, you simply must flush out the dangerous chemicals and toxins that are standing in your way. If you’ve taken any of the common (and extremely harmful) osteoporosis drugs, OsteoCleanse™ can help to flush them out of your system. That’s what it’s designed to do! OsteoCleanse™ is so effective, I recommend you repeat the process twice a year. Now before we go further, I want to put your mind at ease. Some people get a little bit nervous when you mention the word “cleanse…” And that’s for good reason! Not all cleanses are created equal! You may or may not have experience with natural cleanses for your body. If you’ve ever looked into those, you probably know that some of them sound downright crazy! Don’t worry, OsteoCleanse™ is extremely simple. I’m not going to have you fasting for 80 days or living only on cucumber juice or anything weird like that. Instead, the cleanse is made up of six simple steps that won’t take you too far outside your comfort zone. But that doesn’t mean it won’t be powerful! I’ve broken the entire process down into 6 easy steps that you follow for seven days. That’s it! You’ll be amazed at what your body can achieve in a very short time, provided you give it the materials it needs to do its job. When your body has to invest less of its energy dealing with toxins and residual chemicals, guess who gets to enjoy the extra energy… you do! Most people have no idea just how valuable their liver and kidneys truly are. With OsteoCleanse™, you’ll give your vital organs what they need to keep your body working well! Who wouldn’t want to experience a deeper and more energizing night’s rest? Well prepare yourself, because many people report that that’s one of the “side effects” to a process like OsteoCleanse™. No we’re not selling the Fountain of Youth here. Instead, we’re removing toxins from your body. And that means that your cells can renew themselves faster, which leads to improvements in the look of your skin. OsteoCleanse™ is definitely not designed for weight loss. That said, this IS one of the possible “side effects.” But we don’t imagine anyone will complain! 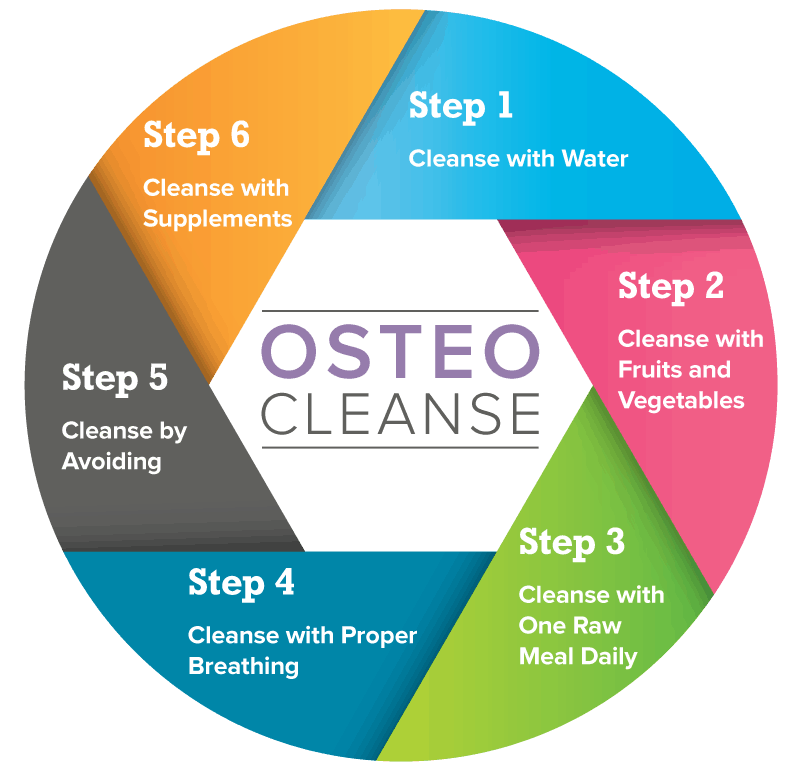 OsteoCleanse™ guides you step by step through the systemic cleanse which is vital to restore your kidneys’ proper function and accelerates your body’s natural ability to rebuild strong bones. I’ve created OsteoCleanse™ as a perfect compliment to anyone pursuing bone health through the Osteoporosis Reversal Program™. It’s a very simple, very powerful way to give your body an enormous head start on your journey. But even if you have no intention of using the full Osteoporosis Reversal Program™, OsteoCleanse™ will help keep your body in a state that promotes optimum health. 5 signs your body is begging for a cleanse. Feeling hot and/or excessive sweating can result from the liver’s role in hormone production going awry. Your liver has a complex communicatory relationship with the hypothalamus, the body’s temperature regulation center. The hypothalamus also plays a key role in bone health by regulating bone-damaging cortisol through the release of hormones. If any of these symptoms sound familiar, your liver is likely in need of detoxification. A very special fruit that boosts your body’s natural cleansing power. It’s an alkalizing powerhouse! The one very unique type of meal you’re going to eat during each day of your cleanse. If you’ve never tried this, it’s going to boost the amount of benefit you get from your foods. Don’t worry, I’ve included a ton of recipes for you! Just don’t hold me responsible if you get “hooked” on this way of eating! An extremely simple activity (it’s not exercise!) you can do to help improve the circulation of important nutrients throughout your body. A very powerful daily habit (it’s not hard) that can help keep your kidneys and liver operating at their optimum levels. The special type of water you should be drinking during your cleanse. Not all liquids are created equal. And even water can work against you if you get it from the wrong source. The ONE most common food you should definitely avoid during the entire cleanse. Without doing this, the results of your cleanse will be far smaller than they should be. The two supplements that are “must haves” during each day of the cleanse. These are extremely common, and together they become a powerful helper in your journey towards bone health. During the seven days of OsteoCleanse™, you’re most likely going to be eating and drinking a bit differently than you’re used to. But that’s the point. And it’s those differences that are going to help get your body on the fast track to bone health. The 6 steps to accelerated bone buildling. The OsteoCleanse™ protocol is all backed by the latest research and is broken into a simple 6-step structure. A simple, clear, road-map that eliminates all guess-work. Uniquely designed to promote bone health and protect kidney and liver function. Restores body’s pH balance by purging stored toxins and acidifying drugs. Focus on health, vitality, disease prevention and wellness. Explains Whys, Dos and Don’ts in clear, understandable “people-speak”. Quick and painless compared to most other Cleanses. Less restrictive on food and drink. No counting of points, calories, carbs or fat grams and no measuring of food. Clear lists of ‘good’ and ‘bad’ foods, proportions and quantities. During OsteoCleanse™, it is important to avoid foods and chemicals that place a burden on the liver and kidneys and are detrimental to bone and general health. 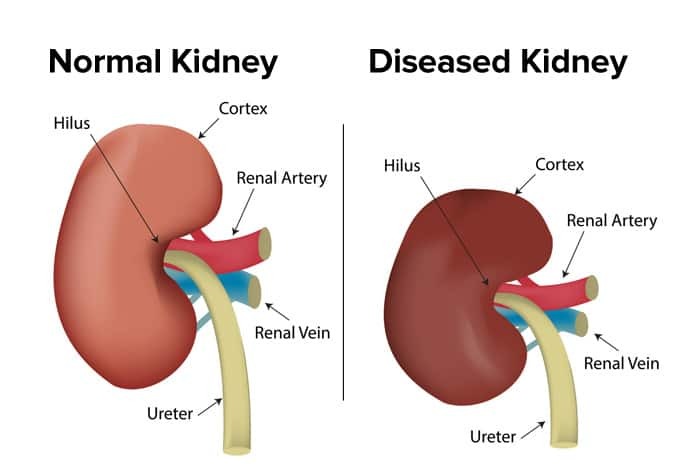 Just as you are engaging in activities and consuming nutrients that support kidney and liver function during this time, you will be avoiding those that do not. BONUS! 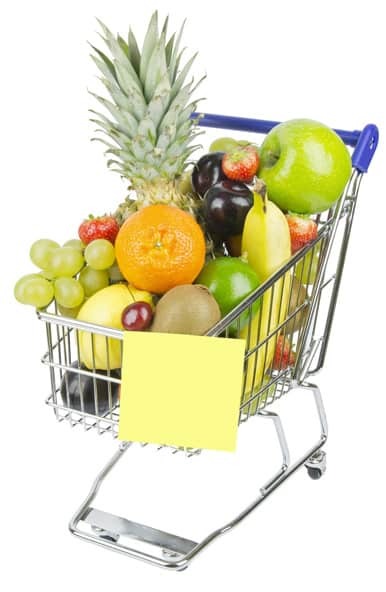 Simple shopping lists take away all the guesswork. With OsteoCleanse™ not only will you know exactly what to eat and what not to – you’ll get convenient ‘done for you’ shopping lists for you to take with you to the store. The whole thing is pretty much ‘paint by number’ simple! I’ve pretty much done all of the work for you. 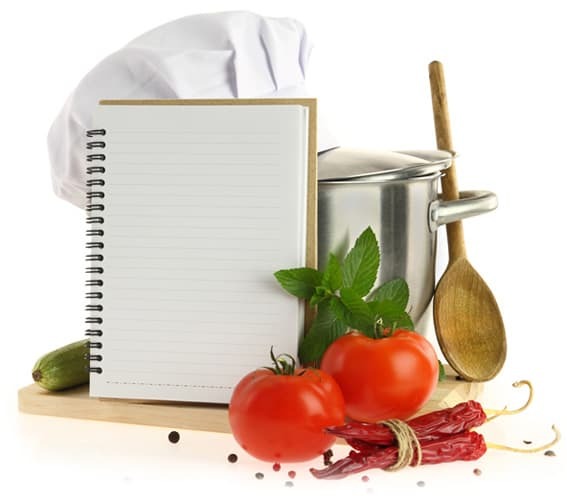 To make things even easier for you, along with the shopping lists, you’ll get over 40 recipes you can use during the process, leaving no stone unturned. If after seven days you don’t experience improved health and energy, simply email Customer Support within 60 days of purchase date to request a full refund. We’ll refund 100% of your money for any reason, no questions asked. What exactly do I get when I order OsteoCleanse™? 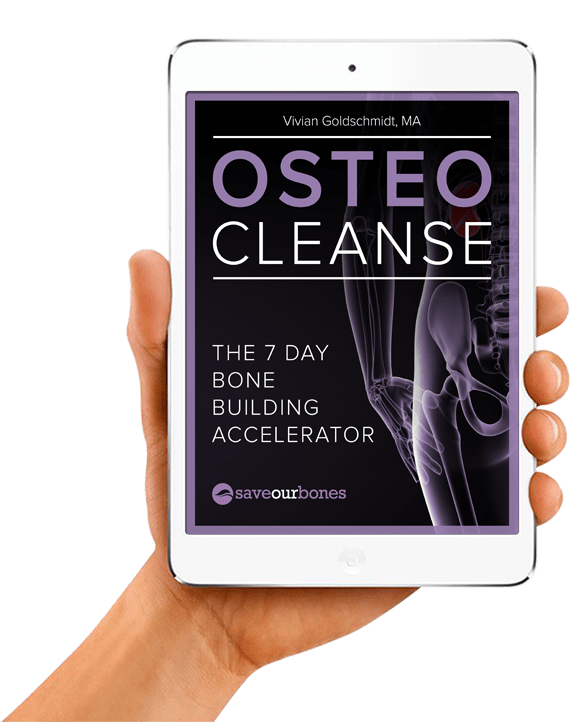 You’ll get the latest edition of OsteoCleanse™, the 7 Day Bone Building Accelerator, in a convenient instant digital delivery so you can get started right away. I do not have the Osteoporosis Reversal Program™. Can I still get results from OsteoCleanse™? Yes. OsteoCleanse™ sets the stage for restoring the health of your bones by flushing out the dangerous chemicals and toxins that are standing in your way. Do I have to buy any special or difficult-to-find foods or supplements to follow OsteoCleanse™? Not at all. 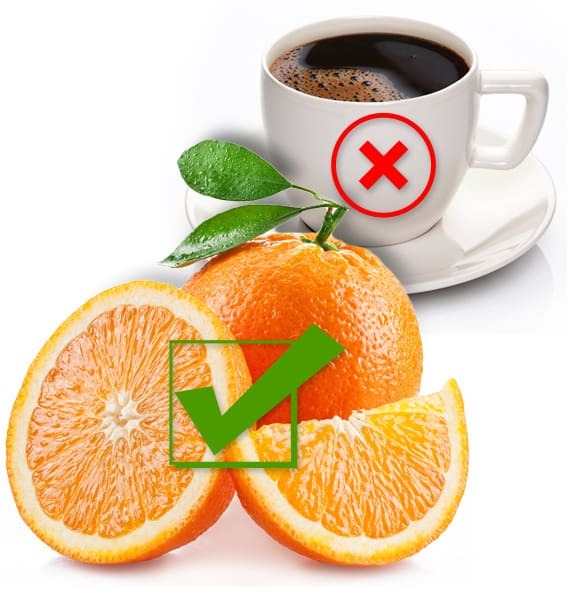 OsteoCleanse™ shows you how foods you can get at any grocery store (you might have some already in your refrigerator) and easy-to-find supplements can help your body get rid of accumulated toxins. How do I know what to do during the cleanse? The cleanse consists of 6 easy steps that you follow for seven days. They are clearly explained in OsteoCleanse™. You also get a shopping list and over 40 recipes! Do I need OsteoCleanse™ even though I never took osteoporosis drugs? Absolutely! If you want maximum benefit from your bone building efforts, you simply must flush out the dangerous chemicals and toxins that are standing in your way. Can OsteoCleanse™ help get rid of the osteoporosis drugs I took in the past? If you’ve taken any of the bisphosphonates, the commonly prescribed osteoporosis drugs, OsteoCleanse™ can help to flush them out of your system. This in turn will restore the natural bone-building cycle your bones need to grow denser and stronger. I was diagnosed with osteopenia, not osteoporosis. Can OsteoCleanse™ help me? Yes. Whether it’s breathing less than clean air, drinking chemical filled tap water or eating preservative filled foods, your bones will benefit from cleansing the many toxins you’ve been exposed to. This in turn will improve your kidney function and help restore bone remodeling. Does my order of OsteoCleanse™ include a money-back guarantee? How can I order OsteoCleanse™? Simply click on the ‘Add To Cart’ button and fill out the information on the page. When all information is completed, click the ‘Place My Order’ button, so you’ll get the digital downloadable format (PDF) right away. Rest assured that all your information is safe and secure. The entire transaction takes place on a secure server using the latest available technology. Help your body heal itself… starting just minutes from now! Get started on the road to good health immediately. 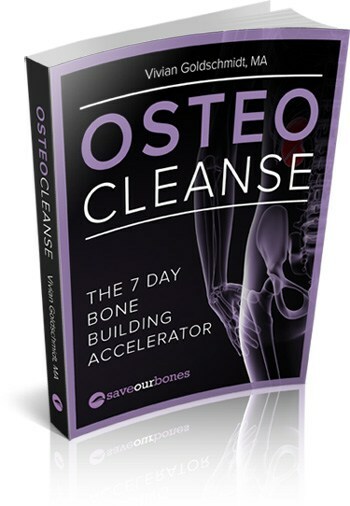 Get OsteoCleanse™: The 7 Day Bone Building Accelerator right away. If you are serious about the future health of your bones, then OsteoCleanse™ can give your body an enormous advantage. Your body deserves the best chance to heal itself, and OsteoCleanse™ is one powerful gift that can help improve that process. Order OsteoCleanse™ today and begin the transformation.